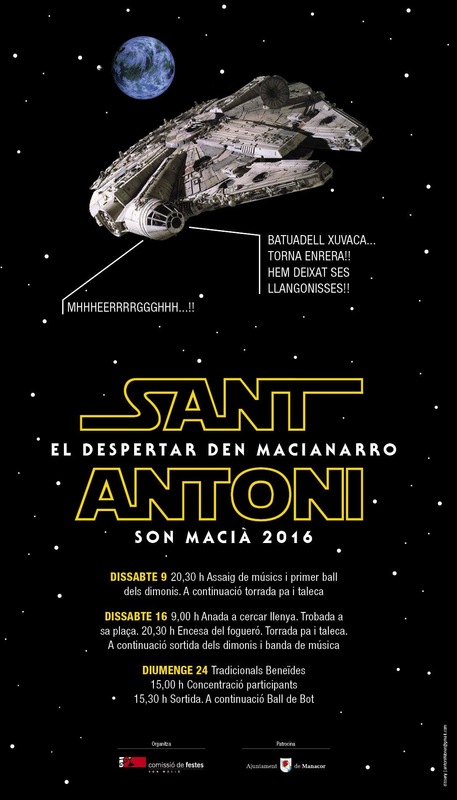 The village of Son Macia, near Manacor, has added a topical touch to the design of their Sant Antoni event poster! Life is never dull on Mallorca. If Christmas, New Year, and Three Kings were not enough celebrations for this time of year, this weekend is the Sant Antoni fiestas. January 16th – the eve of the Saint’s day – is when Mallorcans traditionally light foguerons (bonfires) in the streets and make elaborate effigies of the Devil to set ablaze. Mallorca’s famous dimonis take to the streets with their manic dancing and scary costumes, and people have a jolly good time, cooking food on outdoor torrades (BBQs). And because it can be surprisingly cold at this time of the year (although not this winter, so far), a few libations are usually taken – very often the famous bright green Hierbas de Tunel. In our local town, Manacor, the Sant Antoni fiestas almost seem more popular than Christmas. 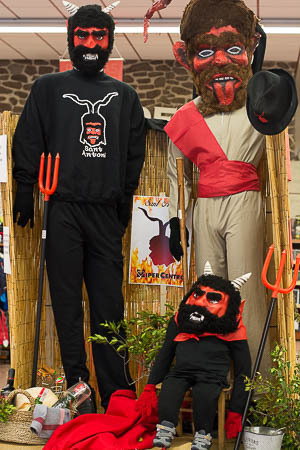 For the past couple of weeks, stalls set up in town on Saturdays have been selling this year’s design of Sant Antoni sweatshirts, t-shirts, and hats – and all at affordable prices. The excitement is building. This morning, doing a few chores in town, we had to drive around a pile of earth in the middle of several roads, on which the bonfires for this Saturday night will be built. These piles will be increasing in number over the coming days. And several shops have incorporated Sant Antoni into their window displays. 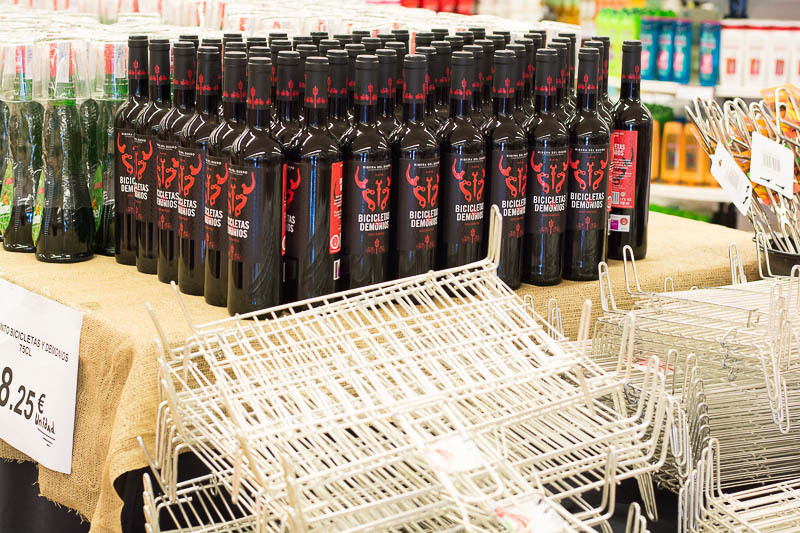 Local supermarket Hiper prepares for Sant Antoni. Hiper’s stocks of wine and BBQ grills ready to tempt us. 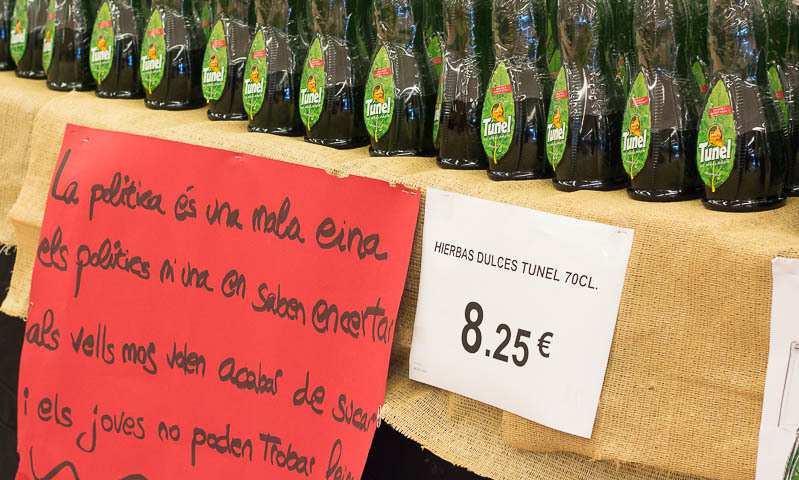 Plenty of Hierbas de Tunel in stock . . . If you don’t know (and I confess that I didn’t until we moved to Mallorca), Sant Antoni was an Egyptian monk who, in the desert, was tempted by the Devil – cunningly disguised as a woman. The iron-willed monk didn’t succumb to these womanly wiles, instead walking on hot coals to take his mind off anything else getting too heated! All this happened a long way from Mallorca, but stay with me. On the island during the 10th and 11th centuries, many folk were affected by a horrible skin disease caused by a poisonous fungus attacking rye crops. No cure was known, but the Mallorcans followed Sant Antoni’s example of using fire to fight the Devil that they believed had caused the disease. The disease is long gone, but the fires burn on every eve of Sant Antoni, as the backdrop to much partying. And, on the Saint’s day itself, Mallorcans head for the streets again – to take their pets and other animals to be blessed by the local priest. After the festivities of this weekend, things will quieten down . . . but not for long: Carnival this year falls on the first weekend of February! You have a good point there. But it really is a wonderful place to live . . . Thank you for your kind words, David, which are much appreciated. Glad to hear Sr Servera worked out well. He’s never let us down.